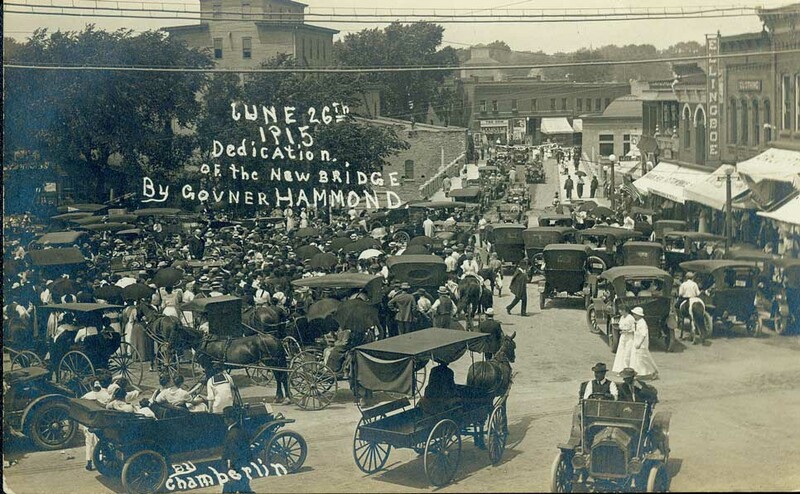 Bridge Square has always been a center of town activity. But it did not always look as it does now—with a fountain, a war memorial, and, in the summer, a popcorn wagon. For many years, the square was either a dusty or muddy expanse of dirt that served as a convenient parking lot for wagons taking material to and from the mills on both sides of the river. 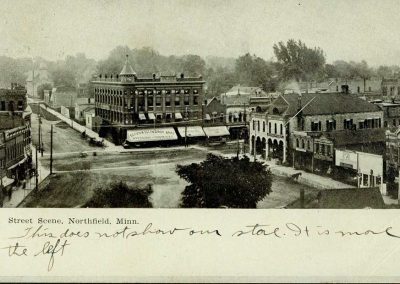 The city’s founder, John North, laid out Division Street so that it runs due south on the east side of the square and at an angle parallel to the Cannon River as it goes north of the square. This decision, and the angle of the bridge over the Cannon, resulted in the “unsquare” shape of the open space that became known as Mill Square. When it rained, the square—which sloped down to the river—turned muddy. Wagons got stuck, and people crossing the square slipped and fell or stomped around in boots caked with mud. When the square was not a sea of mud or a dustbowl, it served as a place where farmers sold produce from their wagons, and others sold hay and wood. In the late 1880s, a fountain was installed in the center of the square to provide water for horses. The fountain stayed there until roughly 1910. By the late 1880s, the square and most downtown streets had been surfaced with rock and dirt. Wooden boardwalks, laid out across the square, made it safer to walk there, but dust was still a big problem. The automobile brought a number of changes to the square. The iron bridge from 1873 was replaced in 1915 with a concrete arch bridge. A year later, the city moved to turn the square into a park. Plans included removing the first Ames mill on the east side of the river and improving the riverfront. But downtown businessmen wanted to pave it to provide parking for cars. The idea of creating a park in the middle of the square won out. 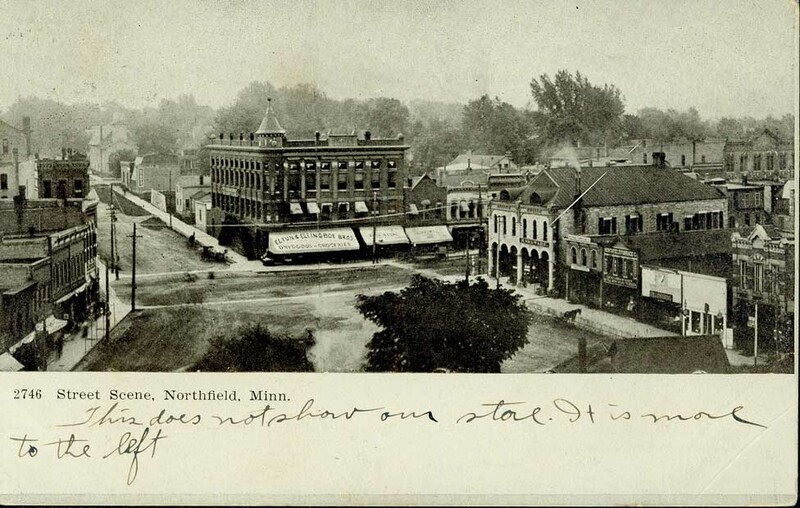 They put a gas station nearby, too, where the Northfield Post Office now stands. This significantly improved traffic patterns in the area. In 1921, a Civil War memorial was erected in the square, along with a water fountain for people. The circular fountain was added in 1980. It was created by Carleton College sculptor Ray Jacobson and was donated to the city by the Sheldahl Company in honor of its twenty-fifth anniversary. Bridge Square has long been the hub of downtown business in Northfield. The lots around the square were the first to have substantial businesses built on them. In and around Bridge Square in 1894, for example, were four attorneys, four bakeries, two banks, four barbers, seven blacksmiths, six book and stationary dealers, six dry goods dealers and six doctors. The square has been the site of numerous parades and demonstrations over the years. In 1912, it hosted a veterans parade, and in 1939, it hosted a grand parade honoring the Crown Prince of Norway, who visited Northfield and St. Olaf College. In the 1970s, students from Carleton and St. Olaf Colleges gathered in the square with townspeople to protest the Vietnam War. Today Bridge Square continues to host community activities year-round—including band concerts in June, and the popular food booths during Defeat of Jesse James Days in September. 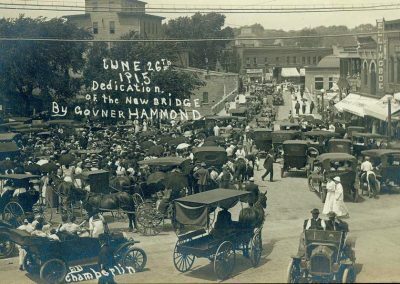 The dedication of the Fourth Street bridge in 1915. A view of Bridge Square from the top of the Ames Mill.